Dear Friends, This trip tends to start slowly due to the children still being in school and no way can you have extra meetings in Japan when school is in. So the first bit is regular church meetings, bible studies, church leaders meetings and family services on the two Sundays. They were all great in their own way and carried on in the blessing I have been seeing this year. One of those churches is a long train journey with two changes to get there and back, in the same day. It is a typical Japanese church of ten adults but as they shared after the church lunch I could only say, praise God, this is all Him not me. They could remember my messages clearly to three years back and each one they said was God’s word for them for that time and they also built up step by step to now when they feel ready to get up and get going. Golden Week began with a bang with a children’s and youth day. Thirty attended from two churches which is a huge crowd by Japanese church standards and especially from the young. They were so open and hungry that the teaching sessions got longer than I planned because they were drawing it out of me and they never noticed the length, it was an amazing experience. The final session was wonderful, finished over an hour late and even then they didn’t want to stop. From the beginning of the worship the presence of God was so strong when they sat down they were still lost in that presence. I felt the strongest anointing of the day and at the end three quarters of them were at the front for a new filling and anointing of the Holy Spirit. As we leaders prayed individually for them many ended up being prophesied over too. Normally when they have been prayed for they sit down but they just stayed there lost in His presence. As a result many were prayed over twice as we were then going to individuals as God led us. Many were standing in tears including macho teen boys where it isn’t cool to cry, least of all in public but when God moves, all inhibitions go. Two of the youth from the church which joined us rang to ask if they could come to camp too so that they could get more. One of the pastor’s son’s went home and after his mother had spoken to him she said, ‘God has touched him, his attitude is very different’. May Camp was definitely the cream on the cake for Japan. I had a more usual number with ten ages ten to twenty years. Of those ten six were very special to me as I have known them since they were born and had input into the whole of their lives. Two were the ones who came after attending the day event and the final two were new ones. The challenges were tough, lives had to change if they were going to ask for prayer to change and I was able to get a bit of leadership training in as well. Nothing stopped them from responding, instantly they were on their feet and at the front. The final meeting I had with just them everyone was out and as I was praying God gave me a long prophetic word for them. One of the boys I have known from birth is adopted and his birth parents were gangsters, he’s now sixteen and has had a lot of ministry over the years. All his life he has held back to the last to respond but this year was his year. He took copious notes (not usually his thing) and in both events he was one of the first to respond and out for prayer every meeting. This touched other areas of his life too as I have never seen him volunteer to do practical jobs to help. The final meeting I was asked to do a family service so when we made the challenge for prayer and every adult responded without prior warning I asked the children and youth to pray for them and they charged straight in and did it without batting an eye lid, normally I would warn them in advance so that they could prepare themselves. So it was with much joy in my heart that I left Japan for Malaysia. Arriving I went straight up north near to the border with Thailand for a few days of one off meetings. I go there every other year and this visit was one of the best. In my host church I was warned before taking junior church, the children are unruly they never sit still, but God answers prayer and they sat like little lambs listening intently. At the end over half responded for prayer and then most of the others came to me afterwards saying they were too shy to come publicly but they wanted prayer too. (Malays are far more reserved and shy than English children are) This meeting was the topic of conversation among the adults when we joined them for the fellowship lunch. Down to Kuala Lumpur for some more one off meetings and then a week living and ministering in my third different orphanage there. I was greeted with the same description and got the same response from the children as I did in the church up north. 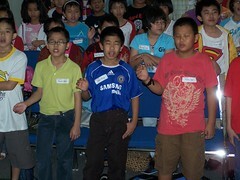 These were mixed group of twenty-one children ages six to sixteen, mostly Chinese Malays. I had meetings everyday and from the start they swallowed up every word and soon all were saved, filled and only a couple of the youngest didn’t speak in tongues. From then on we worshiped God every meeting in tongues. As a result of their moving into God their whole lives changed and we saw changes in their attitudes and behavior One day one of the teenage boys came home from school with a very long sad face and sat the whole meeting with his head down. He didn’t want to miss out so he responded for prayer at the end but he was not himself. I took him aside and talked with him and eventually he told me that he had been made fun of all day and it hurt. I gathered the other boys around him and we all prayed. The next day he came home with the usual smile on his face God had answered and no one made fun of him. The whole group was in raptures when we told them and it was raising their self esteem which they needed. We had healing miracles (healing is not usually a part of my ministry as you know). That night one had a sore throat and had almost lost their voice, they were almost instantly healed. The next night one had a gash going right across the bottom of their foot and another had cuts in the same place, both were limping and afterwards they were walking normally. Each time they gathered around prayed and God healed. My final meeting was Junior Church and on Pentecost Sunday and believing adults and children should be moving in God together I shared on the Holy Spirit. The older children (seven in all) from the home normally would be too old to go there. I felt God wanted to help them push their boat out and do the ministry and praying for of all who responded. This was a big step for them, as children in orphanages often feel less than children in families. I asked them if they would and everyone did, two looked at each other with excitement on their faces and chuckled. Those two I had felt from the first that God’s hand and call was on them and He gave me prophetic words for them. In junior church they acted as if they had been ministering for years and led and prayed for all the children who responded. The response came in two waves and in both instantly everyone they prayed for spoke in tongues. God gave me prophetic words for two children so I had the two who I had words for in the home pray for them. This church has two morning services but children’s ministry is only done in the first one so in the second I just joined the congregation. The teens stayed too and vied to see who would sit by me so to please all I sat in the middle and had a boy one side and girl the other. There was a big response for prayer so I was asked to help pray. I got to the front I felt God say look back and the boy who had sat next to me had followed me along the line and was sitting on the aisle seat. Then God said, “he wants to pray too but is too polite to come forward without you saying”, so I just beckoned him with my finger and he was out of his seat like a shot. He then proceeded to lead four adults to speak in tongues, he was in raptures afterwards. For him an orphan in an orphanage to lead adults was a huge, huge thing but his heart is to serve God and he is one of the two I had words for, his word was about public ministry and he has begun. God worked in a marvellous way in both the country of the most highly educated in the world and in the poorest of the poor who have lost everything in this world. All are precious and valuable in His sight and He treats them the same. A huge part of all this was due to your valuable prayers and help so on behalf of all the children mentioned above I want to say a huge thank you and God bless you so very much for your love and commitment to them and this ministry. It is us working together that produces the fruit.